Senior BJP leader Subramanian Swamy accused the Securities and Exchange Board of India (SEBI) Chairman of bias and becoming a mute spectator in the complaints of Stock Exchange irregularities and insider trading related to Tata Group companies. In his harshly worded three-page letter to SEBI Chairman Ajay Tyagi, Swamy accused him of showing bias and of being silent on the fraudulent activities and violations committed by Tata Steel, Tata Chemicals, and Tata Motors. “It is clear that SEBI arbitrarily and without justifiable reason permitted the complaints to be closed, on the basis of self-certification, which is against the very tenets of natural justice and responsibility of a Regulator,” said Swamy, putting the blame on Ajay Tyagi for dubious activities and for being silent in the matters involving big corporates. Accusing SEBI Chairman Ajay Tyagi of trying to exonerate Tata companies and its head Ratan Tata for Stock Exchange violations, Swamy said that as the Regulator of Stock Exchanges, SEBI should act. The three-page letter is published at the end of this article. “The complaints with you are more than 8 months old, and thus SEBI’s response seems on the face of it just plain prevarication. I can only conclude that SEBI is trying to avoid and evade the investigations which are its responsibility under the law just because the allegations have been made against the Tata’s”. 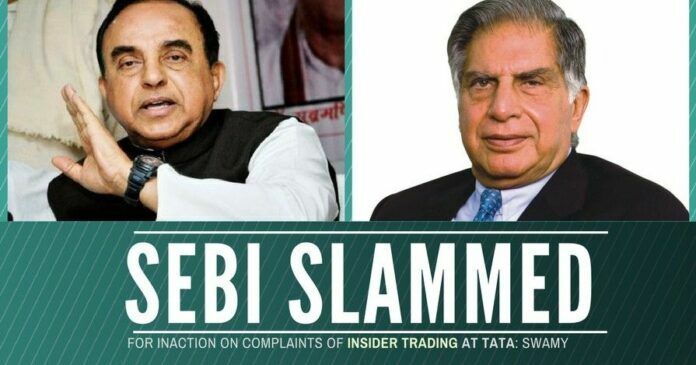 “Tatas themselves have been accused in both the 2G Scam and the Coal Scam especially arising from the deplorable revelations before the Supreme Court in the Niira Radia Tapes matter”, said Swamy accusing SEBI Chairman Ajay Tyagi of his silence. Swamy accused the SEBI Chairman of not acting against the “dubious ways” of Tata Group’s style in appointing Independent Directors, who are actually not Independent. The BJP leader pointed out that Tata Motors and Tata Chemicals’ Independent Directors are linked to Tata Trusts also. “SEBI has ignored this fact that the companies themselves have stated this to their shareholders,” he said, citing examples of violations in the appointment of Independent Directors and Chairman of Audit Committee by the Tata Group of companies. Previous articleHas the FM unilaterally decided to extend the tenure of the CEA? This is not at all surprising. given the fact SEBI stands for “Suitcase Exchange Board of India”. Wonder why agencies go soft on Tata Group, which is involved in all sorts of scams.